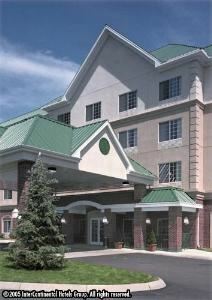 Just South of the Denver Tech Center, the Holiday Inn Express Hotel & Suites Englewood is conveniently located off 1-25 and Dry Creek Road, exit 196. This beautiful hotel is located near Park Meadows Mall, Bronco Training Center, Denver Tech Center, Centennial Airport, Inverness Business Park, Fiddlers Green Amphitheater, the new Porter Hospital and only 20 minutes from Downtown Denver. We have excellent restaurants with in walking distance. We have a breath taking view of the Rocky Mountains and 91 spacious guestrooms that include Suites and Jacuzzi rooms. All of our rooms feature queen or king beds, iron & ironing board, coffee maker, 25 inch color T.V. with remote, Pay Per View Movies, Satellite T.V. viewing, voice mail, 2 phone lines, Complimentary High Speed access, large work desks, and ergonomic chairs. Our suites are complete with a refreshment center that include a refrigerator, microwave, coffeemaker, and appropriate utensils with expanded leisure area and sofa sleeper. We offer a Deluxe Express Start” Breakfast complete with Cheese Omelets or Biscuits and Gravy, Royal Cup Coffee, and more with a complimentary morning newspaper and Rapid Checkout. As our guest you will feel right at home. Enjoy the beautiful traditional décor, an atmosphere loved by business and leisure guests alike. Come on over, un-wind, relax, STAY SMART! The Limerick Room is a private event space housed inside the Irish Rover Pub. We are centrally located in the heart of Denver's Baker District on South Broadway. It is the perfect setting for any special occasion you may have. Our friendly and knowledgeable staff are here to ensure your event goes off without a hitch! We are available for everything from birthday parties, baby showers, rehearsal dinners, wedding receptions, and much more. We have an occupancy of over 100 people with an extensive in house catering menu that boasts traditional Irish fare as well as classic Colorado favorites. WE DO NOT CHARGE A ROOM RENTAL FEE, instead we require that you spend a minimum amount. This allows us to effectively provide service while not passing along any additional charges. Whether you are looking for the perfect pint of Guinness or a spot to dance the night away with all your friends and loved ones, we've got you covered! Check out our website and call for a showing! Hard Rock Cafe Denver is located in the Denver Pavilions, a two-story walking mall on 16th Street recently rated as Denver's number one tourist attraction. But that doesn't mean locals don't hang out here, too! We are a spot for everyone and easy to find - just look for the 20-foot neon guitar. At Hard Rock Cafe Denver, great food and friendly service are paired up with a living museum of music history. The flexible floor plan at Hard Rock Cafe Denver makes our location the perfect venue for nearly any event – from corporate team building to a rocking birthday bash. Our professional event planning and catering team will ensure your next event is a huge success. Forget boring business meetings and lame parties; host your next event at Hard Rock Cafe Denver. Rist Canyon Inn is a 120 year-old farm house set among old growth trees, lush golden pastures, and a glistening creek, only minutes from Old Town Fort Collins, Colorado. Lovingly restored by the owners, the Inn blends rich historic details with refined modern touches. The main house serves as the bride’s quarters, offering a spacious living / dining room, a sun drenched salon, a covered porch, a full kitchen and master bedroom. The nearby groom’s cabin contains a charming pine living space, a kitchenette / bar, and a creek-side patio. And, accommodating up to 100 guests, Bellvue Hall is a professionally-designed 1,865 square foot event space perfect for wedding receptions, corporate retreats, and celebrations. Lone Tree Golf Club & Hotel is a unique venue featuring a boutique hotel and the only public course for championship golf in South Metro Denver. Our 18-hole, Arnold Palmer-designed course offers golfers, hotel guests, and those planning a social event a memorable experience in a country club setting. Lone Tree Golf Club & Hotel is the perfect venue for social events, wedding ceremony & receptions, fundraisers, corporate events and golf tournaments. You can rest easy knowing our professional staff will attend to every detail surrounding your event, leaving you to do nothing but enjoy. Overlooking the lush, 18-hole championship course, the stately clubhouse boasts a 15 boutique rooms, a large dining hall, fireplace lounge with built in dance floor, a large outside covered patio with views of the city and the course, as well as a lush outside garden featuring a grand pergola among mature landscaping. For business purposes, we have 4 meeting spaces available to rent as well. Sitting on 30 beautiful acres, Hudson Gardens has year-round facilities for social events, meetings, and memorials. For indoor events, choose from the Inn, the Rose Garden & Garden Canopy, and Monet's Place & Welcome Garden Pavilion. These three facilities include unique outdoor spaces, which combine to offer guests a dynamic experience within The Gardens. Whether you will be hosting a small group, a grand wedding, or a business meeting, Hudson Gardens has the perfect space to accommodate your guests. Our beautiful ballroom offers panoramic views of Downtown Denver & the Rocky Mountains. We pride ourselves on providing quality service while delivering unforgettable moments. Our full-service hotel ensures you will have everything imaginable available to you throughout your wedding weekend, and your guests from out of town will enjoy comfortable accommodations with generous amenities and a variety of local activities to keep them busy. Our gorgeous Skyline Ballroom is located on the 11th floor of the hotel and boasts breathtaking views of the Colorado Rockies and downtown Denver skyline. Enjoy an incredible view of Denver’s famous mountain sunsets during dinner, followed by glistening stars and the city’s twinkling skyline lights as a backdrop while you dance the night away. The Skyline Ballroom consists of 3,500 square feet of space to accommodate 150 guests banquet style with dance floor and head table, and up to 250 guests in standing reception. In 2019, one of the most beautiful venues in Colorado becomes even more beautiful as we renovate the entire Clubhouse! The newly remodeled Antero Ballroom is now open for your next event! Bold and beautiful, it's the perfect setting. With over 37,000 square feet at our beautiful club house, we offer any size event, meeting, or wedding a wonderful experience. We have rooms that can be intimate for a 25 person affair or seat up to 280 in our ballroom depending on the type of setup desired. We also have great outdoor space at our fire pit patio and Eagle's Nest Patio. Very affordable! Don't hesitate to contact us today to schedule your celebration! The mansion offers an elegant setting for weddings, receptions, holiday parties, meetings, and retreats. Celebrate your next special event with us and we promise to help make your memories last a lifetime. Host your next event at the historic summer home of the Unsinkable Molly Brown for an unforgettable day. With amazing gardens, enclosed pavilion event center, attentive coordinators and staff, we can help you create the perfect backdrop for the most important day of your life. Our pavilion provides a wonderful mixture of natural light, thanks to our generous picture windows and 20 pairs of french doors. Our Pavilion lights are specially angled to provide “daylight” lighting without the glare while dimmers provide perfect setting for your presentation on our 70? smart screen TV and Bose sound system. At The Molly Brown Summer House, we pride ourselves on being an uncomplicated Venue. We reserve our venue for you and only you, so we never double book. There’s no one in front of you, and no one pushing you out, and we do all the work. Many guests appreciate one simple price which includes everything and we have made every effort to accommodate the pricing preferences of all. If you have any questions don’t hesitate to call us!